Motorola has just published the results of a new study that examines the smartphone habits of people and how that impacts their relationships with the people around them. The results of the study are as eye-opening as they are depressing. Thirty-three percent of respondents in the study prioritized their smartphone over meaningful interactions with people they care about. As expected, smartphone addiction is much more severe among the younger generations, with “53 percent of Gen Z respondents describing their phone as a best friend”. Gen Z refers to those born in the 1990s and early 2000s. Meanwhile, 61 percent of participants wanted a better ‘phone-life balance’, with as many as 60 percent saying that “it’s important to have a life separate from their phones”. But what exactly constitutes smartphone addiction? The study was commissioned by Motorola, and developed by psychologist Dr. Nancy Etcoff from the Massachusetts General Hospital Department of Psychiatry. Dr. Etcoff also happens to be an expert in ‘Mind-Brand Behavior and the Science of Happiness’ at Harvard University. It surveyed 4,418 smartphone users between the ages of 16 and 65 in the US, Brazil, France and India from November 30, 2017 to December 26, 2017. The research also identifies ‘three key problematic smartphone behaviors’ that affect interpersonal relations negatively. First off, there’s ‘Compulsory Checking’, with 49 percent of all respondents agreeing that they check their phone more often than they would like. Again, the problem is much more prevalent among young people, with nearly 60 percent of millennials and Gen Z participants admitting to it. To add to that, 35 percent respondents agreed that they spend too much time with their smartphone, while 65 percent admit to panicking at the thought of losing the device. Following the findings of its study, Motorola created a fun 10-question quiz that people can take to check if they are addicted to their smartphone. Depending on your answer, you are categorized in one of five different levels, ranging from a ‘Phonosapien’ (“just a human with a phone”), to a ‘Phonatic’ (“you never don’t use the phone”). 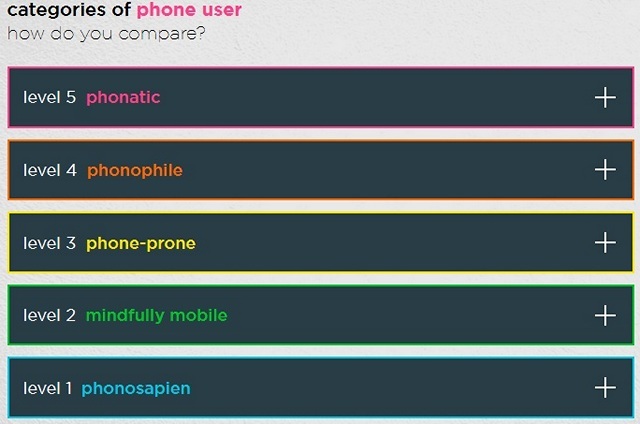 I took the quiz, and turns out, I’m at level 4, or as Motorola calls me – a ‘Phonophile’. That makes me just one step away from that slippery slope of smartphone obsession otherwise known as Phonatic. Thanks, Moto. Either way, the company is also doing something serious about the issue by teaming up with the ‘SPACE – Break Phone Addition‘ app, which offers “a 60-day program to help smartphone users become more mindful of their phone usage”.